Growing up in Mumbai, India, Rahul Samant learned the value of hard work and humility early on. After earning a degree in electronics engineering from the University of Mumbai, Samant left India to begin a job as a software programmer in London. It was the first time he was ever away from home… and the first time he was ever on a plane. “It was total culture shock, and I really had to grow up fast,” said Samant. 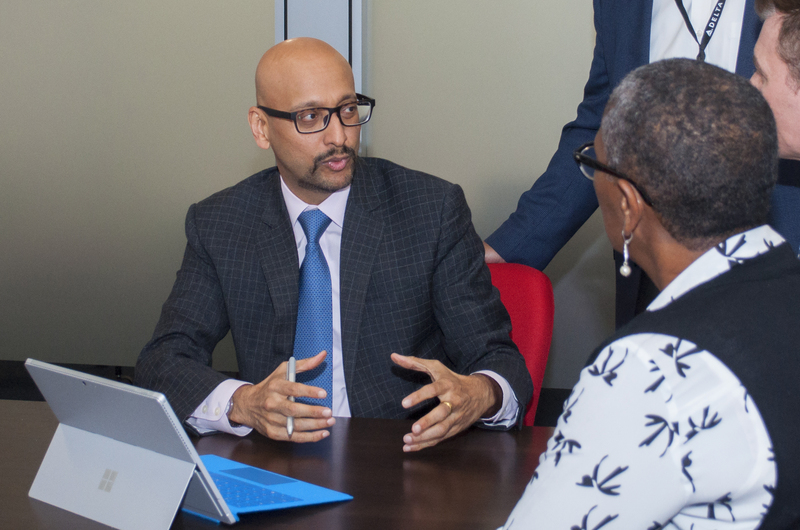 As he began his climb up the corporate ladder, the virtues his family instilled in him became his guiding force – constantly reminding him of how far he’d come and the future he dreamed of building. “I always knew I wanted to be the CIO of a major company and managed my career to that overall trajectory,” he recalled. 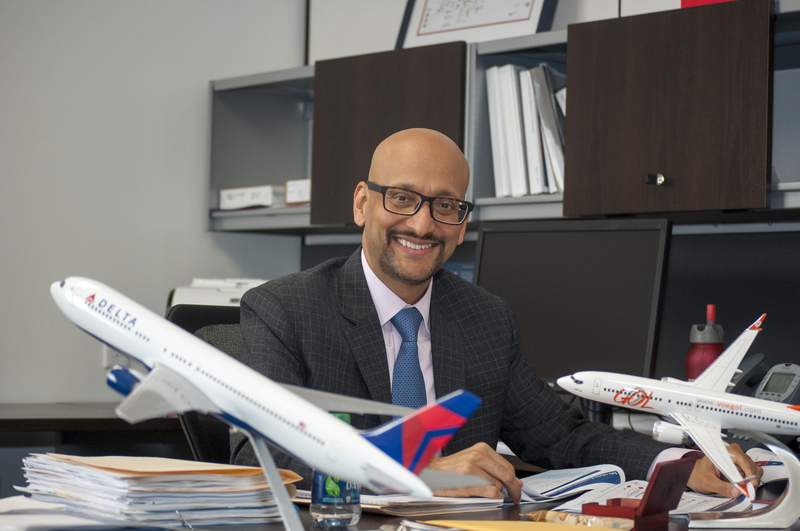 Following 23 years in financial services at American International Group and Bank of America, Samant joined Delta in February, a path he never imagined, but one he says he’s fortunate to have found. At AIG, Samant was Chief Digital Officer, responsible for company-wide digital strategy, which included developing programs for client engagement, new business models and digitized operational processes. Prior to AIG, he held various positions at Bank of America, including a two-year stint as CIO of the company’s wealth management division and another three years as the CIO for consumer channels. Just six months into his new role at Delta, Samant got the call every CIO dreads: IT systems were down, impacting operations systemwide. Over the next 72 hours, he led Delta’s IT team through the recovery effort and committed to ensuring such an outage would never happen again. Before that call, Samant had already begun the early stages of a multi-year IT transformation of infrastructure, applications, cyber security and data – all vital parts of nearly every aspect of the customer and employee experience. In a recent interview with Delta News Hub, the airline industry newbie and proud father of two shared insights into his ambitious new role, what other tech leaders inspire him and how one of his pet projects turned into a real job. Delta News Hub: What role does technology play in an airline like Delta? Samant: Delta is the world’s most reliable airline, and IT has a foundational part to play in keeping aircraft flying safely and on time. Those are the table stakes. The outage and resulting operational disruption we recently experienced shows just how important a solid, reinforced IT foundation is to our business. The entire leadership team is committed to ensuring that kind of event doesn’t happen at Delta again. Having a strong IT infrastructure is essential for IT to achieve our higher purpose to power our customers’ experience from beginning to end in a seamless and engaging way. Therefore, we continue to deliver more and more functionality directly to our customers via our mobile and web channels, while at the same time, we equip and enrich our frontline employees with the tools they need to deliver the best customer service in the industry. I never miss an opportunity to chat up a flight attendant about the functionality of their SkyPro tablet or shadow a below-wing ramp agent to see firsthand how the new RFID baggage tracking is being implemented. I’m always finding new ways to immerse myself in the inner-workings of our business. And as technology changes, we will listen, learn and deliver to our customers’ and employees’ needs. DNH: What's the most important thing you're working on/focused on right now? Samant: Here at Delta, we have embarked on a multi-year, multi-phase journey to transform IT and provide a more reliable experience for both our customers and employees. Our mission is two-fold. We want to make technology a source of competitive advantage for Delta, not just be a support function, as well as be a partner of choice, not just be utilized out of necessity. We’re also laser-focused on hiring new talent and retaining a highly-skilled workforce. Ultimately, our aim is to blend those with expertise in the airline domain with those who have backgrounds in contemporary technologies, like Cloud, API’s and mobile. In May, Delta launched Comfort+, a seating class with extra legroom and additional amenities such as free craft beer and wine. Rolling out this fare type for purchase required Delta to change mobile and web applications, as well as modify reservations, customer service and other back end systems. In April, we launched our new and improved employee intranet, Deltanet, which over time will serve as a single point of entry into a wide variety of resources. And Delta has a number of exciting IT-enabled projects in the pipeline for the remainder of the year, including the “Flight Family” project focused on improving communication during the boarding process and the launch of our new routes to Cuba. The Flight Family Communications project aims to improve communication efficiency through peer-to-peer messaging across the teams who work together to get a flight out on time. This pilot project will include select flight attendants, gate agents, FlightOps and Operations and Customer Center participants on select flights. Launching service to Cuba is another important project on IT’s to-do list. People often don’t realize the choreography it takes to launch a new route, from the hardware and software applications to the connectivity to the setting up the various airport workstations. It really takes a village, and IT has a hand in it all. DNH: What do you think makes a successful leader? How would you describe your leadership style? Samant: Leadership is about driving change, especially in our uber dynamic world. To lead well, one must instill commitment and inspire a following. I have three basic tenets for my own style. First, I prize humility and candor. Second, I live by the three “Ts” – trust, transparency and teamwork. Third, I lead people AND manage work. When you do the opposite, you risk becoming a micro-manager. What’s most important in a transformational journey, like the one we are embarking on, is creating a realistic vision of our airline powered by reliable, thoughtful and innovative technology, aligning the team with this vision and then making all of them a part of the journey to success. DNH: What’s been your greatest challenge or career setback and how did you overcome it? Samant: In 2008, I was the CIO for the wealth management division at Bank of America and was in charge of the integration of an acquisition. Despite rigorous testing, the account conversion went horribly wrong. There were many reasons for it, but as the leader, I took full accountability. I led the recovery efforts, rallying both our business colleagues and my own IT and operations teams, to remedy the issues account by account. At the time, I was based in Boston but relocated to New York City for two months until we had the situation under control. DNH: What’s your greatest achievement and how has it shaped you? Samant: In 1998, as part of a capstone project for my MBA at Wake Forest University, I researched and wrote a paper recommending my employer at the time, Bank of America, globalize their IT operations. I spent the next 24 months circulating the paper to executives several levels higher than me. Finally, I found a willing sponsor who took me under his wing and asked me to turn my pet project into a full time job. By the time I was done rolling out this new program, we had a global network of centers on three different continents. More or less, it was like I was an entrepreneur and catalyst for change inside of a major Fortune 500 company. I got broad exposure to disciplines across the company, from cross-border funding to human resources hiring to real estate transactions… and I was a 30-something IT guy! DNH: What words of wisdom or career advice would you pass on to others? Samant: Never be on autopilot with your career. If you don’t have clear goals in mind, you’ll never know which path you’re supposed to take and may never feel that fulfillment we all crave from the work we do. And when it comes to networking, quality trumps quantity. Invest in those relationships and you will earn those connections over time. Remember, networking is nourishing relationships when you don’t need them, not when you do. DNH: What do you enjoy doing when you have the opportunity to step away from the job? Samant: I treasure time with my wife and my two daughters, one is 22 and the other is 19, especially if we are traveling together since we all enjoy going to new places. I also love reading history and a good spy novel. Before joining Delta, I was very active with an organization representing the Indian diaspora in Charlotte and would like to find another organization or activity that’s close to my heart here in Atlanta when I have a bit more time on hand. DNH: What’s your favorite travel destination? Samant: I have a special fondness for London, since it’s the first destination I flew to in my life. But I have enjoyed some very diverse places around the globe, like Istanbul, Dubrovnik, Machu Picchu and Hong Kong. My favorite spot in the world is to stand on the Kowloon side of Victoria Harbor looking at the Hong Kong skyline. It is a spectacular view! My travel tip: Get there at twilight and watch the lights come on, then catch the ferry across. DNH: Where do you most want to travel but never have been? Samant: My family and I have a long bucket list. In total, I have traveled to 46 countries – three new ones since joining Delta. Russia, Iceland and Australia all top my list of places I want to go, and of course we fly to all three! DNH: What’s one thing you would never travel without? Samant: I am a really light sleeper, so my eye mask and ear plugs go with me everywhere just in case the shades in the room don’t close all the way or there is too much ambient noise. DNH: Which TV shows are on your must-see list? Samant: I recently finished Season 4 of “House of Cards.” I also love “Elementary” because Sherlock Holmes was my childhood idol. DNH: What’s on your music playlist? Samant: I enjoy a lot of different music, but I mainly carry a large collection of Indian music in two languages on my iPod. It ranges from the 60s to the 2000s. I love it for the nostalgic value. DNH: What’s the last book you read? Samant: I recently read this really interesting tech book called “Exponential Organizations” and met the author who grew up less than a mile away from where I lived in Mumbai. Since joining Delta, I made a point to read “Glory Lost and Found.” It was quite educational for me as a newcomer and filled me in on the ups and downs the airline has gone through. I am amazed at the resilience of Delta’s employees and the strength of its culture through the tough times. DNH: What is your favorite or most notable item in your office? Samant: My growing collection of model planes, thanks to Delta President Glen Hauenstein. He seeded the collection with three really awesome ones. DNH: Who’s your personal hero? Samant: I am the product of my varied experiences and the many mentors who have guided me along the way. When I think back to what my parents did for me and the values they instilled in my brother and I, they are the people I admire most on this planet. DNH: Who are your social media influencers/who do you follow on Twitter? Samant: I follow a lot of different tech publications for my own continuing education, like Engadget, TechCrunch, Mashable and CNET. I also follow some of the most notable leaders in the industry like Microsoft CEO Satya Nadella, Apple CEO Tim Cook and Google CEO Sundar Pichai. I also keep tabs on my favorite cricket players, the Prime Minister of India, plus close friends and ex-bosses! The airline’s Meteorology teams continue to monitor and update weather forecasts.